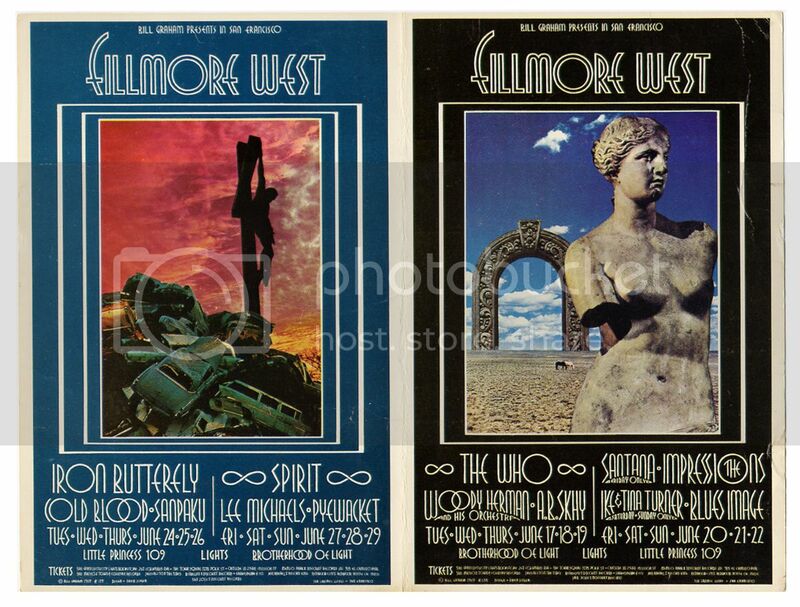 This is a rare BILL GRAHAM PRESENTS “JOINED” DOUBLE handbill/postcard mailer (#BG178 & BG179) from concerts at the FILLMORE WEST in San Francisco, Ca. There were FAR fewer of these printed than either individual handbill. The left side is IRON BUTTERFLY, SPIRIT, LEE MICHAELS & COLD BLOOD and the right side is THE WHO, IKE & TINA TURNER, SANTANA, THE WOODY HERMAN ORCHESTRA & THE IMPRESSIONS. The mailer is in nice shape with only one vertical fold between the two designs. NO TEARS or PINHOLES! There is a fair amount of soft creasing, the worst being in the upper right corner. Will display great in a frame. BOTH designs are by artist DAVID SINGER. 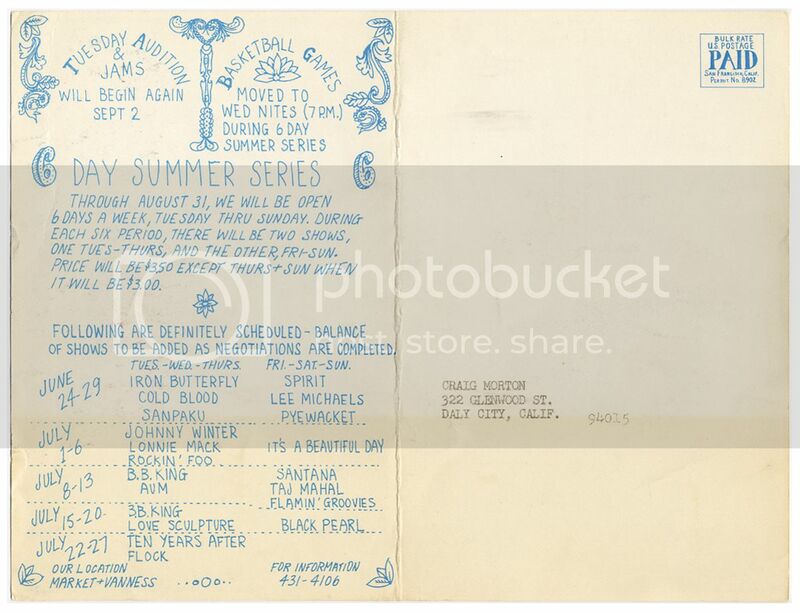 This double-sized postcard mailer was printed once before the concert. It measures 7″ x 9 1/4″. Categories: MUSIC, PAPER PRODUCTS, Handbills. Tags: collectibles, Cold Blood, Ike & Tina Turner, Spirit, The Impressions, Woody Herman Orchestra, Bill Graham Presents, Fillmore West, handbills, Iron Butterfly, Lee Michaels, music, Pop Culture, postcards, Santana, The Who. Be the first to review “IRON BUTTERFLY THE WHO SPIRIT SANTANA Fillmore West “JOINED” Mailer (June 17th 1969) Rock Music” Click here to cancel reply.